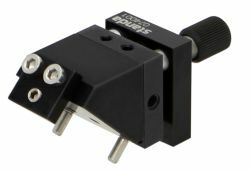 Miniature Precision Mirror Mounts ensure precise angular adjustments of small optics about two orthogonal axes with 10 arcsec sensitivity. For mounting the M4 and M6 taped holes are provided. 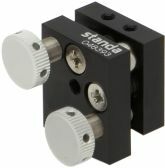 These black anodized aluminium mounts are ideal for holding of 25 mm and smaller optic in tight spaces. 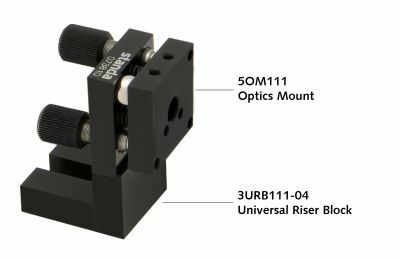 Mirror / Optics Mount 5OM111 provides smooth and precise adjustment with sensitivity of 10 arcsec. 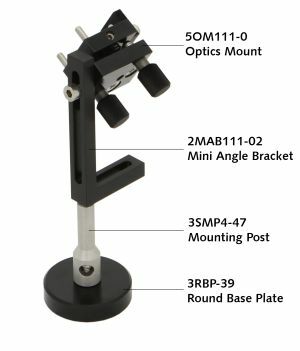 It can be used as a tilt platform – with the Spring Clamp 4SC-28M4 and Mounting Post 3SMP4-47. Platform of the mount has a clear aperture of 6.2 mm in diameter. 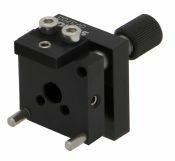 The mount has holes of M6x0.35 mm pitch on its base for adjustment screws. Alternatively, to order the mount with wrench driven screws, you append the code of that screw: 5OM111-9S127H. 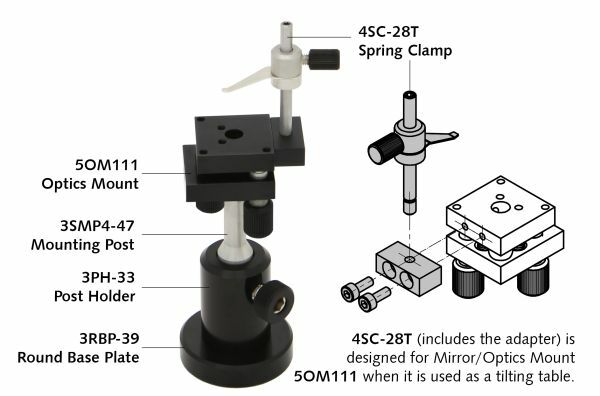 Mirror / Optics Mount 5OM111 with adapters 5OM111-A0 and 5OM111-A45 are suitable for round (Ø24) and square optical elements. 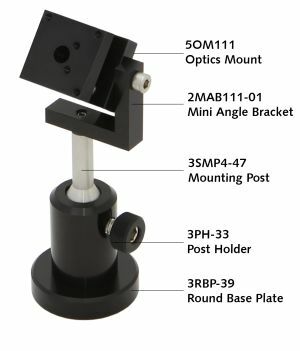 For coarse adjustments about horizontal axis compact mirror mounts can be used with Mini Angle Brackets 2MAB111. To mount Mounting Posts 3MP4, 3SMP4 or Universal Riser Blocks can be used. - 5OM111-9S127H-0: Mount 5OM111 with 9S127H screws and with adapter 5OM111A0.